This is the fundamental question. When you know the answer, you will know the “Fundamental Theorem of Integral Calculus”. The upper graph shows the velocity as a function of time for an object that happened to have a constant velocity of 10 m/s. The lower graph shows the position vs time for the same object. The velocity is constant so the position graph is linear with a constant slope. For a given time interval, the area under the Velocity vs. time graph will be equal to the change in position during that time interval. If f(x) is the derivative of F(x), then the area under the graph of f(x) is equal to the change in F(x) over that same interval. Step 1: Find an antiderivative. Step 2. See how much the antiderivative changed by over the interval. For example, suppose we want to know the area under the graph of f(x)=x2 between x=1 and x = 2, as illustrated below. Let’s see. Can we find an antiderivative? Oh, yes, this one we did already. F(x)=(1/3)x3 is an antiderivative of f(x)=x2. So now we just have to see how much F(x) has changed over the interval from x = 1 to x = 3. But what if I can’t find the antiderivative? I still don’t see why this is so important? Are there lots of areas to be found in AP Physics? If you have been working your way through these Summer Reading posts, then at this point, you know how to find “derivatives” for a nice collection of reasonable functions. Nothing too crazy or exotic — just the kinds of functions that you will meet early in AP Physics C. And you also know why we find derivatives: derivatives are slope-finding formulas. Velocity is the rate of change of position with respect to time. Acceleration is the rate of change of velocity with respect to time. Force is the rate of change of momentum with respect to time. 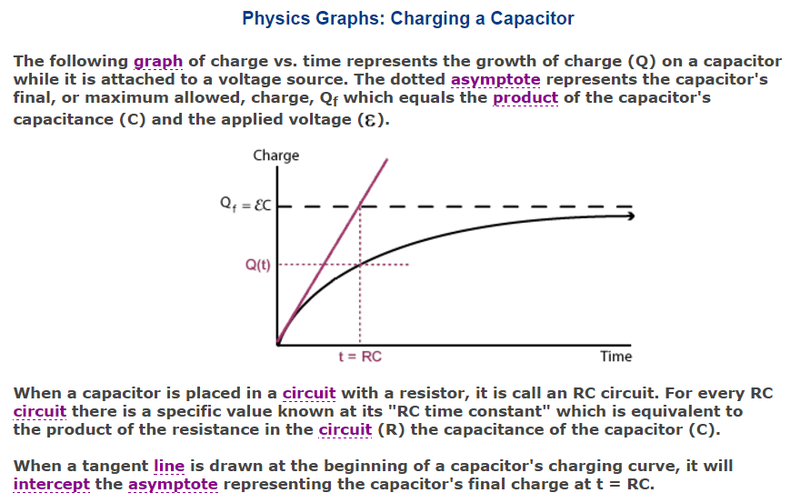 Current is the rate of change of electric charge with respect to time. CAN WE PLAY THE GAME IN REVERSE? If I give you a function, can you find an “antiderivative”? But you don’t have to take my word — go ahead an take the derivative! You will see for yourself that the derivative of F(x)=(1/3)x3 is indeed f(x)=x2. So F(x)=(1/3)x3 is an antiderivative of f(x)=x2. So if you can find one antiderivative, you can find a whole family of them. Still, most times, you only need to find one. In our AP Physics class, when the antiderivatives are hard to find, you can have a little help: your TI89s or N-Spires know how to do this. So does Wolfram Alpha. Nobody would be willing to invest so much effort in finding antiderivatives unless there was something really useful about them! This is just another way of saying that F'(x) = f(x). And, in addition to calling F(x) an antiderivative, we also sometimes call it the “indefinite integral of f(x)”. 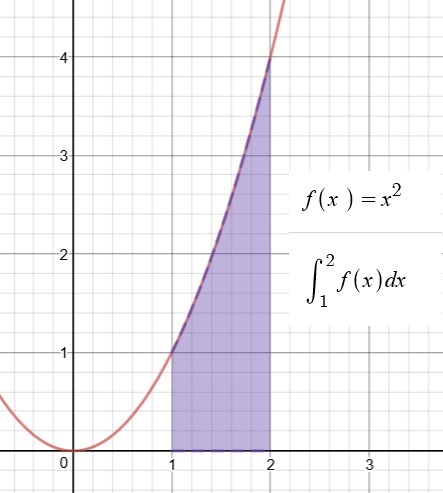 The definite integral is the area of the region bounded by the function, the x-axis and the two “limits of integration”: the vertical lines defined by x=a and x=b. This is a FUNCTION which has f(x) as its derivative. This is an AREA — a numeric value. Why do mathematicians use these similar names and symbols for these two very different ideas? Are they secretly related in some FUNDAMENTAL* way? That is the topic of the next post. AP Physics C is a calculus-based course. At my school, calculus is a co-requisite. Some of the entering students have already had one quarter of calculus but others will just be starting their first calculus class in September as they start our physics class as well. I have put together a collection of posts to give everyone an introduction so that we can use calculus from day one. These posts are their summer reading assignment for AP Physics C.
AP Physics-C is a college-level introduction to Mechanics and E&M (Electricity and Magnetism). As you will see, many of the ideas of physics are expressed in the language of calculus. This may sound intimidating but the use of calculus actually makes things easier. After all, much of calculus was invented for the specific purpose of doing physics. To help you to a smoother start in physics, I have prepared a series of blog posts that I would like you to read over the summer. For some of you, most of this will be a review – but definitely not all of it! But for others, this will all be new. Just take your time, read slowly, and feel free to ask lots of questions — you can save them for September or email me as you think of them! Students who have successfully completed the two practice sets will have an easy time of it on our first test of the year. And I believe that you will find that the information will also help you in your calculus class. One other note: we will be talking a lot about rotational physics this year. It would be helpful to have a clear understanding of radian measure. If you feel at all shaky, you should review these two posts: Angle Measurement for Pizza Crust Lovers and That Radian Feeling. If you have any questions about any of these posts, please feel free to email me. I hope you have a relaxing summer and that you are looking forward to another year of interesting physics. 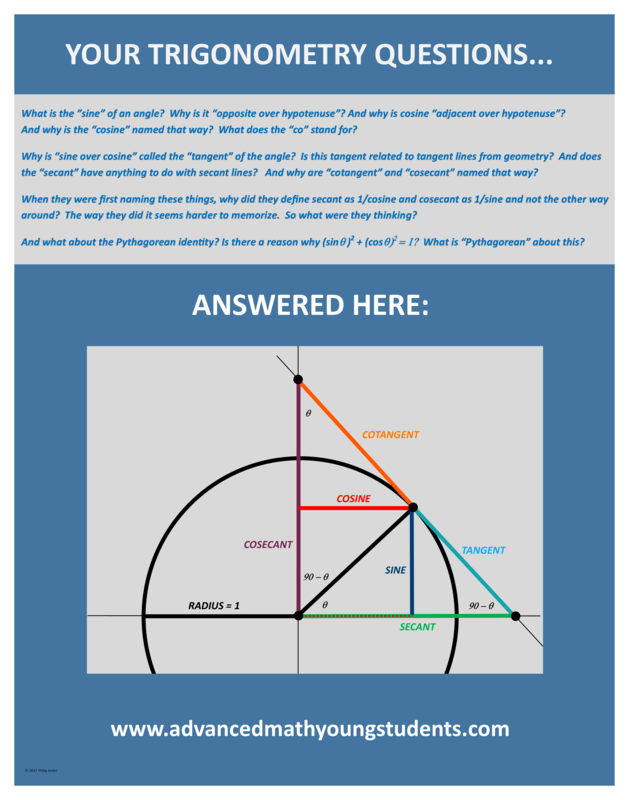 Whenever I show this diagram to students, they seem actually excited to discover the meaning and reasons behind so much trigonometry that they had previously just memorized. It makes me believe that it would be helpful if this diagram was displayed in every room where trigonometry is introduced. And now it can be! I tidied up the graphics and made it into a poster. Also, I recently gave a workshop about this. You can see the slides here. Now, how do I get THAT on a t-shirt? For more than half of the problems on this test, there is another way to solve the problem, a way that is sneakier, more creative, a little subversive. It’s good to have more than one way to attack a problem, so read on and learn to play. Trial and Error = pick an answer, play with it, see if it fits what they said in the problem. As algebra goes, this is not that bad. But you can also just try the answers. Lazy kids try b first but no luck. Then they try d and their laziness is rewarded. Well, you should REALLY know how to find a linear equation from a graph. So I guess I am saying DITW. But you can also pick a point on the graph, say (1,2) and then see which equation works. If you are unlucky and two answers work (as would happen if you chose m=2, d=4) then pick another point and try again. If you can do the algebra to solve for P, go ahead. But this is also a classic back door problem. Make up #s that fit, get your answer and then plug your #s into the answer choices. And another back door! Draw a rectangle, pick a value for w, make the length 6 more than that, find the perimeter and then stick your w number into each answer. Why do algebra? Try the numbers! 5 works, -1 does not. No need to check 0 (but it doesn’t work either). And yet another back door! Try x = 4, see what you get. Then plug x=4 into each answer. You do have to know that this is a circle centered at (6,-5). Draw the picture, fill in the center and the endpoint that they gave you: P(10,-5). Then look at the answers and plot them on your graph. There will only be one that could be anywhere close to the other end of that diameter. The SAT LOVES this kind of problem. The official solution shows the algebra method. They also discuss a slick think-around. But they forget to mention that you can also use trial and error. For example, say there were 20 2-person tents (B). That takes care of 40 people. The other 40 of the 60 tents would be 4-person and would hold 160. That adds up to 200 people, but we need 202. I bet choice C will work. Try it! 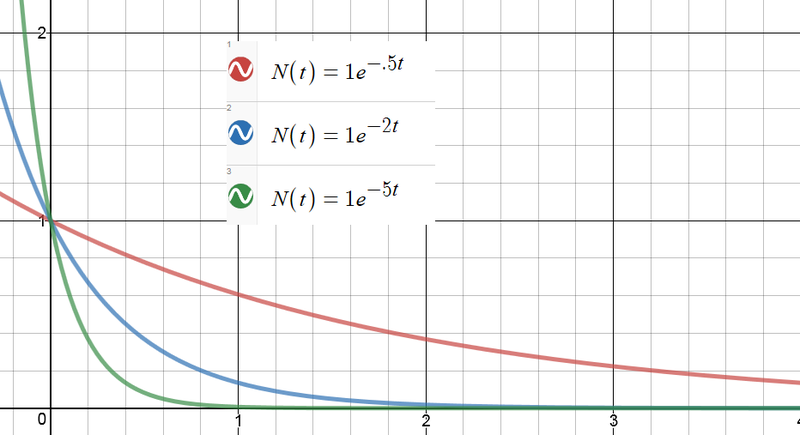 If I plug in x=-2, the graph tells me to expect an output around almost -20…try the answer choices. Make up an a and a b that fit: for example, a=1, b=4 — in other words, this is yet another back door problem! While I still think you should know how to write a linear function, note that the right answer has to give an output of 1.9 when the input is 13. So check the answers to see which one does what it’s supposed to. They LOVE this question too: y=ax+b and a is the rate of change, b is the initial value. If you know that, this is kind of easy to be problem 19. This is a classic ratio problem: set up thing1/ thing 2 = other thing 1/other thing 2. 4. While you COULD plug x=19 into the equation they give you, you could also estimate directly from the graph. You have to extend the line a little bit but the answer is clearly a little more than 50 and clearly less than 55. Since you don’t actually have to solve the system, it’s better to DITW. Y=mx+b and the slope is 3. If you see that you can multiply both sides by x+1 to get (x+1)^2, then you take the square root of both sides. That’s their way. You could also do trial and error. Or, since this is the calculator section, if you have a ti89 or an nspire, you can let the calculator do the algebra for you. You have a calculator! They give you a formula. And they give you answers! Try them one at a time. When you get 473, stop. An odd and interesting question. But DITW. This will be an easy back door play as long as you know what a negative exponent means and what ½ as an exponent means. When it says a ^(-1/2) that means “one over the square root of a”. So if you make a=25, x will be 1/5. Now go to the answer choices, plug in 1/5 and see which comes out as 25. It will be undefined when the denominator = 0. But you can skip the algebra and just try the answer choices. Notice how much easier it is now to find mean, median and mode. Yet another question testing your ability to interpret y=mx+b. The m is the slope which is also the rate of change. I am sure that many students who think they are too advanced to bother making up numbers will actually get this wrong (by putting b). Say t=3. Calculate 1800(1.02)^3. In 3 years, there are q=12 quarters. Put q=12 into each answer choice. You will see that it is a and not b that’s the answer you were looking for. 24. Well, DITW…but also: you get this wrong by assuming things that the problem never said. In the math section, as in the reading section, that will burn you every time. Yes, you could find the slope and intercept and then write the equation…but here’s something helpful to notice: when you plug t = 10 into the right answer, you better get 846 back as your answer. Start calculating! DITW and note that this is a righteously challenging question, as it should be for its location in the section. You do not need to know how to calculate standard deviations. You just need an intuitive feeling that if the data is clustered around the mean, the std. deviation is low and if it is spread out, the std deviation is higher. Then, you can just eyeball this one. First of all, eliminate c and d — they are exponential but the problem says “constant rate” so you know we need linear graphs. And after 20 minutes, 30% of the paper is gone so 70% remains or 3500 sheets. So of the two answers, pick the one that comes out to 3500 when you plug in m = 20. DITW and it’s a good problem! Remember: early grid-in should be easy. Don’t be psyched out by the chemistry. You have 51 thingies. They each contain two smaller thingies of one kind and one of a second kind. So overall, you have 102 of the first kind and 51 of the second kind. Stick in x=1. Algebra or trial and error to find what works. If you multiply both sides of an equation by a constant, it’s an equivalent equation with the same solutions and the same graph! It’s easy to see that the constant they multiplied by this time was 3. So 10 x 3 = 30. Yes, you can set the two equations equal and do the algebra. Or you can let your ti89 do it. Or with any graphing calculator, you can graph both equations and then trace along until you find the intersection. But my laziest students draw the g function’s graph by hand! You know it starts at (0,10) and it has a slope of -1. So go to (0,10). Then,go down 1, over 1, down 1, over 1 (watching the scale of the graph). In two steps, you will land on the first intersection point. This is exactly the kind of question that rewards thorough SAT prep. It looks very hard. But then you notice that the angles they ask about are complementary. And you know the rule for complementary angles: sine of one = cosine of the other. So they subtract to get zero. If you take 5 practice tests, you will see this concept tested 3 times. And this is DITW as well. OK, I count more than 30 out of the 58 that have at least one alternative solution! The other day, a colleague showed me a diagram about current vs. time in an RC circuit. The diagram helped me realize that there is another way to think about time constants and exponential decay, a way I had completely overlooked. I had all the right pieces floating around but I had never put them together. The only difference is the value of the constant, k. Higher values of k lead, in a sense, to faster decay. We call τ the “time constant” for this decay. It has the units of time. And it gives us an intuitive feeling for how fast a function is decaying. For every time constant that passes, our decaying quantity gets reduced by another factor of e.
So after one time constant has passed, the function’s value is No/e. After two time constants, it’s No/e2. After three, No/e3 …and so on. But there is another way to think about the time constant. The time constant tells us how long it would take to reach the asymptote at the current rate of change. In the still picture above, you can see the tangent line at t=0. The dotted green segment on the t-axis represents the time it would take for the tangent line to reach the asymptote. When you run the video, you will see the function decrease and the tangent line get shallower. But that green segment stays the same length. WAIT – WHAT’S A TIME CONSTANT NOW? But now suppose that at some moment, the decay rate were to become constant. Instead of taking forever, the function would now be able to reach its asymptote in a finite amount of time. Not in just any old amount of time, but in fact in an amount that equals the “time constant” of the decay. It doesn’t matter what moment you pick. From any starting point during exponential decay, if the rate were to stay constant (which it doesn’t, but still…) the time to reach the asymptote would always comes out to τ = 1/k. Or to say the same thing geometrically: the tangent line from any point on the curve will intercept the asymptote after one time constant has elapsed. That’s what the animation is trying to emphasize. I chose a k value of .2 so my time constant was 1/.2 = 5 seconds. If you open the Desmos file, you can change the constants to see what changes and what doesn’t. SO WHY DID THIS SURPRISE ME? I wasn’t making the connection between the exponential decay and the differential equation lurking in the background (even though I teach that connection and have blogged about it). And if slope is rise over run, then run is rise over slope! 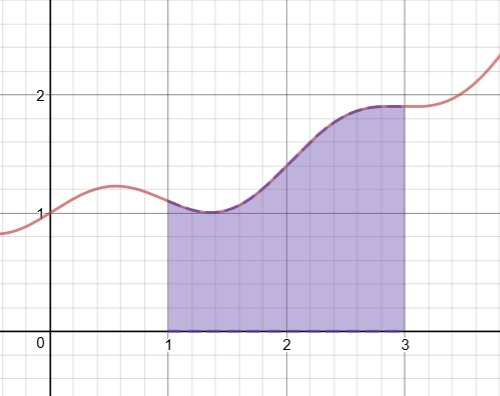 When the function is starting from a higher value, the tangent has a slope that is PROPORTIONALLY higher! So that proportionally higher slope will get you back to the asymptote in the same amount of time every time. I’ll leave a more rigorous, math-y proof as an exercise for those of you in your first calculus class. I already had the spreadsheet with the random integers. But Excel does not have a “number of discrete values on the list” function. So even there, I was stuck. But since JT only rolled the dice 5 times, I did eventually come up with a way to have Excel do this for me. Let’s call it the “Go Fish” procedure, naming it after the simple card game. It’s not very elegant but it works and, as you will see, it pays extra dividends. For each possible dice value, 1 through 6, I made a column that answered the question: did this value appear on the list. For example, the formula in my first column answers the Go Fish question: got any ones? This generates a value of 1 if any of the dice came up as a 1 and zero if none of them did. I made a total of 6 columns like this. Then, the sum of those columns tells me how many distinct values appeared in my original 5 rolls of the dice. From there, it was just a matter of doing this in every row and taking the average. Again I did 10 years worth of rows. So the answer was yes if the question was got any 1’s, 2’s or 3’s and no for any 4’s, 5’s or 6’s. That gave a total of 3 distinct values this time. OK, so now I have a rough idea of the answer. But aren’t I just stalling? I should get back to work calculating the probabilities and expected values. Say you want to know the probability that your list contains a 1. That is more easily calculated as 1 minus the probability that it contains no 1’s. P(got any ones) = P(got any twos) = P(got any threes)…and so on. So the expected value of the total of the “Go Fish” questions = 6 times the value for any one of them! That means we expect 6×(1 – (5/6)5) = 3.589 different results every time. So I am feeling like this is a promising answer. I would still like to go back and finish calculating the probabilities the hard way. But the point to notice here is that taking the time to simulate the problem also provided the key to a solution path. A good puzzle is a torment. And there is something interesting about probability puzzles in particular: you can’t always tell how tricky they are until you dig into them for a while. Sometimes a question that seems quite tractable ends up eating up more time and more note paper than you were expecting. James Tanton has been dropping puzzle after tormenting puzzle on Twitter over these past weeks. The first one was interesting – and I think I have it solved. But he was just getting started. I roll 5 dice every day for a year, recording my high score each day. At the end of the year, I average those high scores. What average should I expect? What we need here is the expected value of the high scores. So first we need the probability of each high score. Then we can multiply each of those probabilities by its corresponding score. The sum of those products will be our expected average. What is the probability of a high score of 1? P(high score is 1) = (1/6)5. What is the probability of a high score of 2? P(high score is 2) = (2/6)5 – (1/6)5. What is the probability of a high score of 3? P(high score is 3) = (3/6)5 – (2/6)5. P(high score is 4) = (4/6)5 – (3/6)5. P(high score is 5) = (5/6)5 – (4/6)5. P(high score is 3) = (6/6)5 – (5/6)5. OK, then we go ahead and multiply each probability by its score and add them up! As you can see, I actually simulated 10 years of dice rolls. And then I did it again. And again. And again…The last 5 times I did this, I got 5.4055, 5.4127, 5.4389, 5.4477 and 5.4211. Well, how much harder can this be? Ha! Stay tuned…here it is! 2. There way is to distribute and then group terms, which is fine. But you can also make up a number for x (say x=5), see what you get, and then see which answer choice gives the same value. In other words, this is actually an entry-level back door problem. 3. If you don’t feel liked doing algebra, just try each answer choice in both equations. 7. Another back door: make up a number for x, get an answer, put that made up number into the answers. 8. Their way is fine, but they say it the slow way. Also, like many SAT questions, they intentionally give you the info in an inconvenient order. Start with the fact that 90% of what he earns is $270. So without doing algebra, think: what number when reduced by 10% lands you on $270? I would not be surprised if $300 was your first guess. Then, since he already earned $80, he needs another $220. At $10/hr, that’s 22 hours. Also, just for the record, you could also do this one by trying each answer choice one at a time. 10. This looks like it is going to be much harder than it is! But it turns out that when they gave you the roots, they also gave you the factors: (x+1), (x+3) and (x-5). Only one of those is an answer choice. 13. Seriously? Yet another back door problem: make up a number for x…. 14. Still no algebra required. The lower limit is obviously zero – as it is in each answer choice. The upper limit can be found by trial and error with the answer choices. For example, is the width 20? Well, 2.5 times 20 give a length of 50. This gives a perimeter of 140 and we have not even added in the height of 60 yet! So 20 is too big…I’d try b next. Can you see why? 15. OK, start by making up a number for x and getting your value for the expression. Then, you can either solve for the k value that gives the same value – or use trial and error. So, if you are keeping score, this problem lets you show off both of the two major algebra-avoidance techniques. Nice. 16. When they give you one algebraic expression and they ask you for another, you should be on the lookout for simple ways to convert one into the other. In this case, dividing both sides by 2 does the trick. 18. If you only know one thing about radians, know that π radians is 180 degrees. If you know a second thing about radians, know how to take that fact and scale it up or down. 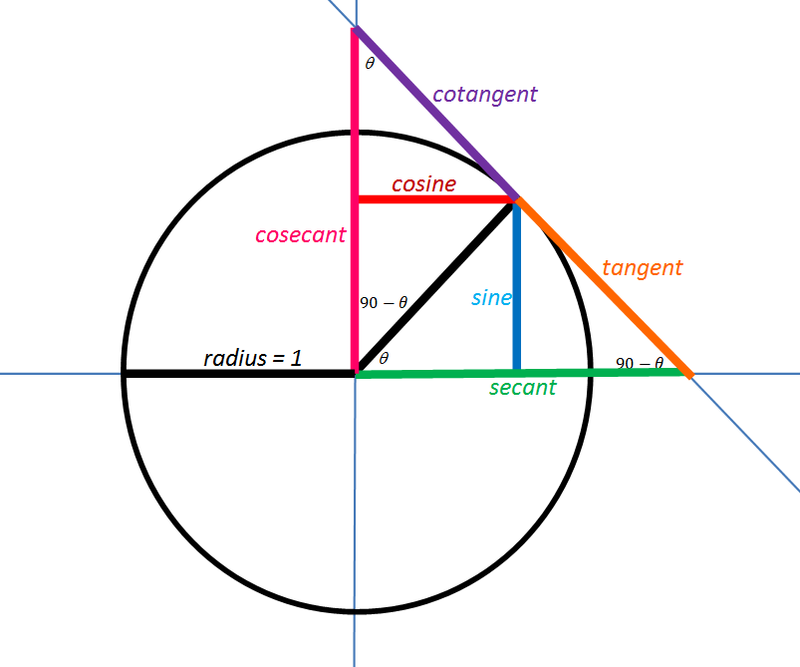 So if π radians is 180 degrees, 2π radians is 360 degrees, and 4π radians is 720 degrees. 19. All of my students are laughing at this question. They know that if you just make a really neat drawing, the answer will be staring right at you, no algebra required. 4. 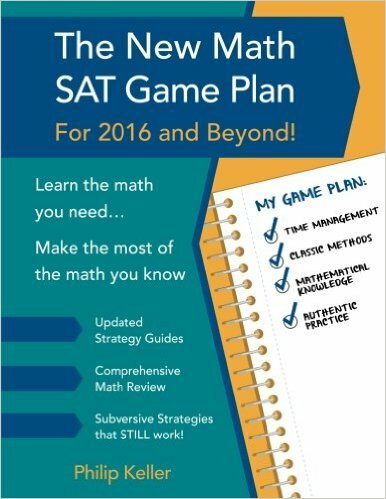 DITW – and this is a common question-type on the new SAT. Don’t assume more than what the problem actually states. 6. Stick in x = -3. Then, do trial and error with the answer choices. 9. As we said earlier, look to transform what they give you into what they ask for. In this case, you can add 6 to both sides, then divide by 9. But if you don’t like that, here’s another way: mess around with numbers until you find an a, x and b that make the equation true. For example, a=2, x=1, b=1…it works! Then, use those numbers to answer the question! 12. You should learn the fast way to do percent changes: A 6% increase is the same as multiplying by 1.06. If you knew that, you could just try each answer choice with ease! Or take the $53 and divide it by 1.06 to get the initial price. 14. The relevant geometry fact is that the angles of a quadrilateral add up to 360 degrees. Then, while the algebra is pretty easy this time, you could also do trial and error if you prefer. 16. If you approach this by making up numbers that fit, you will find that you are done in moments. 17. And here it is: another example of y = b + mx. The b is the flat fee and the m is the rate per mile. This is a very common question on the new SAT. 18. Once you see what they are asking, this is not that bad. I’ll translate for you: find the point with the highest y-value. Then, tell me how far that point is vertically from the line of best fit. 19. They want you to solve for w in terms of A. But if that gives you trouble, this is also a classic back door problem. Make up w and A – if you are lazy, try w = 26, A = 1 – then go see which answer works. 21. This is another linear modeling question. Make sure you know that if y=mx + b (or y=b+mx) the b value is the starting value and the m value is the rate of change. This time, they are asking for the rate of change, so pick two points and find the slope. 22. This is really just asking if you know how to find a median. But be careful! Many students will go right to the middle of the chart and say that the median is 19.5. That’s a trap: you have to list the data in ascending or descending order and only then can you go to the middle of the list. 24. Well, you can debate whether this is fair or not. It certainly favors the kids who have had physics. They would know right away that 72 is the starting height. You can think of it as the height you get when you plug in t=0. 25. This one is silly. If you could make up values for x and k that go together, you could just see which answer works with those numbers. But wait! You don’t have to make up the numbers – you can pick them right from the chart. For example, use x=9 and k=37.7 and see which answer is true. 26. If you see the algebraic method, that’s fine. But if not, use the values in the chart to make up numbers for p, f and c so that the total of the calories comes out to 180. It will take you just a few moments to find a possible set. Then you can stick those numbers into each answer choice. 27. You should know the quick way to do percent increases and how successive equal percent increases leads to exponential growth. (See pages 181-183) This is a frequently occurring SAT item. You want to be able to do this about as fast as you can read it. 28. Make up numbers for a point on the line. A line has only one slope. So far, we know it has risen 6 and run 3. So keep doing that to find another point. You could use (6,12). For that matter, you can even use (3,6). Then, check out the ratio of t to s using your point. 32. They are hoping to make you use the slope formula. And they know that some of you will mess up subtracting fractions (even with a calculator). But you can also carefully find two point that have integer coordinates and then get rise over run by just counting boxes. Of course, you first check to make sure the boxes are the same scale – and they are. 33. I suppose you could do algebra for this one. But why not take a few attempts at trial and error first. I’ll get you started: could it be 35 right and 5 wrong? That would be 70 – 5 = 65 points…too high, try again. I promise you will land on the right answer in just another guess or two. 35. Again, a little trial and error before you wade into the algebra. This time, it took me three tries. But that’s because I didn’t notice that zero works! Also, you TI89 fans are probably laughing about this one. If you are wondering how I knew how many of each to list, you need to examine the chart a little more carefully. I went by what the chart said! Once you have the 20 data points listed, you can easily add them up and divide by 20 to get the average.